Halifax have signed the BARLA centre Chester Butler on a one year contract ahead of Sunday’s pre-season opener against Super League neighbours Huddersfield at the Shay (3.0). Butler, who toured South Africa this summer, had already agreed to play for the club’s newly re-formed reserve side but has now signed a full professional deal to ward off potential interest from a Super League side, believed to be Warrington Wolves. The former Brooksbank School pupil only took up the game in his mid-teens after his potential was spotted by the former Halifax player and coach turned PE teacher Damian Ball. 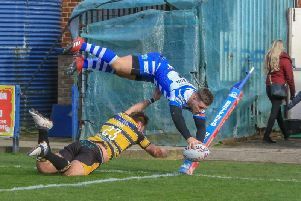 “Chester only came to the sport relatively late, so he’s probably still a little bit raw and it’s meant he has gone under the radar a little bit,” said Fax boss Richard Marshall. “There was some Super League interest in him, but he’s quite an astute young guy, he’s considered all the facets of that decision and I think he sees he could really accelerate his development here. “Physically, he’s a good, natural athlete, so he can already compete in that sense; we’ve seen that already during some opposed training sessions. “He’s quite skilful, he’s not afraid to talk and he’s a local player, which is important for us. “We’ll get him settled into the reserves first, but if he works hard then he can put himself in contention to be in and around the first team over the next year or so. Marshall, who will name his selection for the Infirmary Cup date with the Giants later in the week, has also added to his coaching staff, bringing in the former Fax player Steve Greenwood to work with the reserves. Greenwood, a former Park Amateurs player who has been coaching Siddal’s under 23 team, played alongside Marshall as a junior. “Steve’s a good coach and a good, honest person; I’ve known him a long time and he’s got plenty to offer us,” said Marshall.